Some guy with way too much time on his hands had some sort of epiphany when he did a Google Search on his name. He thought of meeting the other “Jim Killeens” he found during his search on Google and wondered if they would allow him to interview them. It appears that he feels that this endeavor isn’t a waste of time, yet, may even be his chance to break into the film industry. 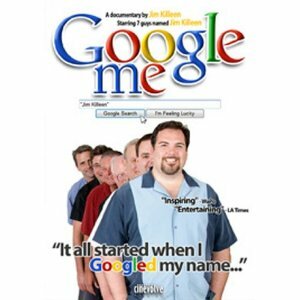 Google engineers want to make all of the worlds information accessible and now views “Jim Killeen” as a concept in light of hearing of this film. The folks at Google were delighted to hear about his project, and thought it was cool. Name must be Jim Killeen. Not James or Jimmy. Must have been found using Google Search. He will travel to their hometown and do what they do. they must be willing to get genetically tested to see if the are related to each other. 24 Jim Killeens were found and many of them turned him down for his interview request. Although some may view producing such a movie as a cool idea, we think this was a stupid idea, and a waste of time, and we hope Jim Killeen didn’t suffer any bankruptcy during the production of the film, or the ramifications of wasting time on it. Jim Killeen feels this movie will be part of his legacy. At the time of the production of this movie he had no kids, no girlfriend, and did this project as a way to “quit wasting time”. Although we are living in an age of technology never before seen in modern history, there are better uses for it than this.